Command & Conquer Red Alert 3: Uprising includes four new mini-campaigns, three of which revolve around the Soviets, Allies and the Empire of the Rising Sun Factions. 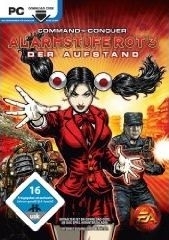 The fourth campaign features one campaign entirely focused on Yuriko Omega, the seemingly harmless Japanese schoolgirl-turned-deadly-weapon by the Empire of the Rising Sun. The player controls Yuriko Omega in a dungeon-crawler style campaign, as she develops her powers and fights her way out of a psychological research facility. In the new Commander’s Challenge, players encounter 50 unique and challenging scenarios, each with its very own over-the-top and distinctive twist, confronting players with everything from giant bears and an entire army of Yurikos to massive satellite showers. Starting out with limited units at their disposal, players gradually unlock more units, technology and new challenges. Each challenge is equipped with a par time that is up to the most competitive players to beat.